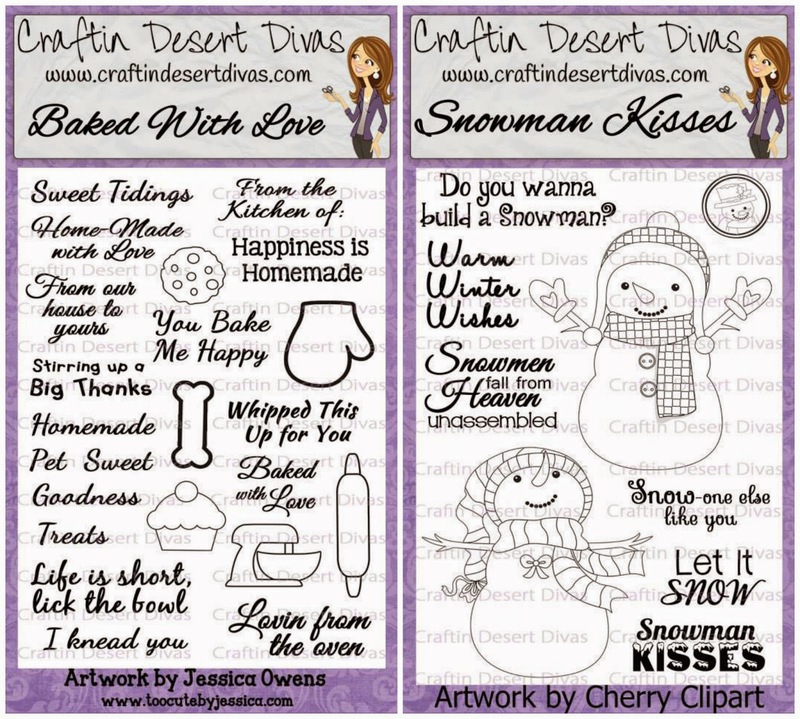 Welcome to our ninth Craftin Desert Diva's stamp release blog hop!! 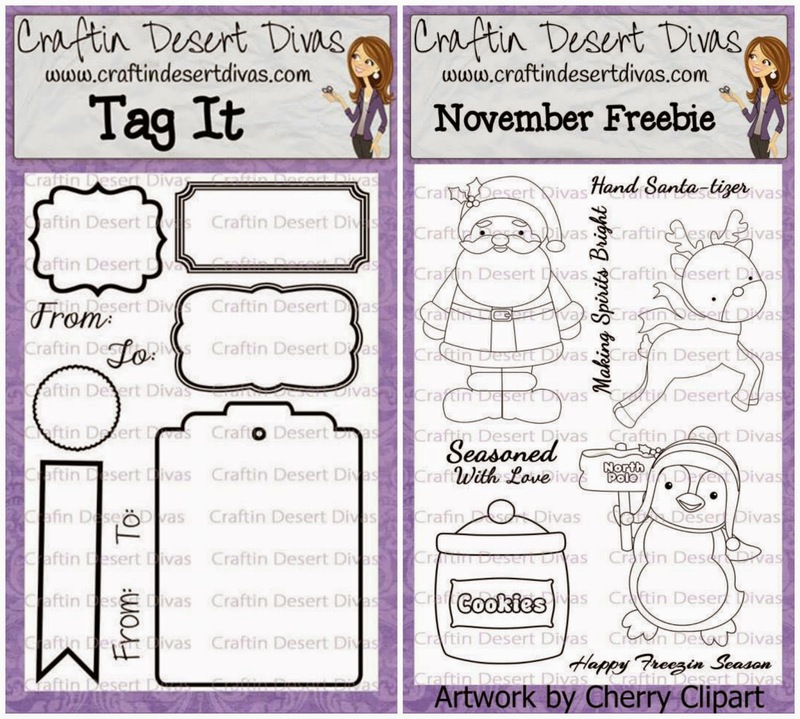 We're super excited to share with you in full the CDD November release stamps. 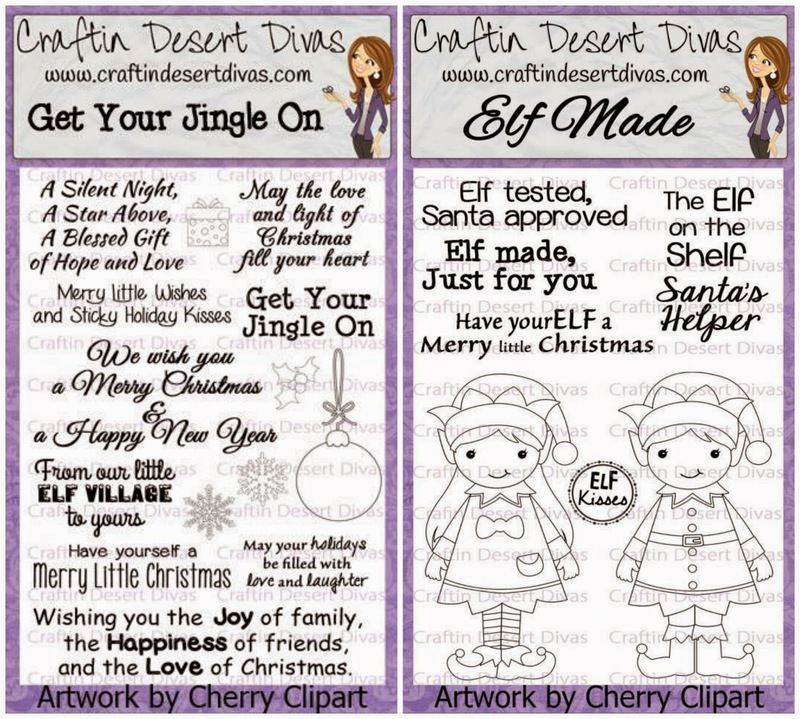 For this 2 day hop the CDD DT are being joined by the Too Cute by Jessica DT to share some awesome Christmas projects for you. There are five new stamps that are being released today in the Craftin Desert Divas Shop and are available now for purchase. This makes it so easy, you just cut out the image and then stamp on it. The SVG cut file will be in the CDD Gallery for you to download or after purchase just send an email to craftindesertdivas@gmail.com to claim your SVG cut for the stamp set you purchased. Tara has also added images and sizes for the SVGs in the CDD Shop. 1. Use Code: NOV to receive 20% off your entire order. Sale ends Dec. 5 Midnight MST. Today you can get this freebie pattern by following and commenting on ALL the blogs in today's hop. After you have done this you can email craftindesertdivas@gmail.com or send Tara a message on FB to claim your pattern. There will be a New pattern and hop line up tomorrow. Make sure to start at CDD so you don't miss out! What would be a blog hop without some more prizes?? 1. CDD giving away 1 stamp a day. I thought this girl baker from the free pattern from Too Cute by Jessica that you can get today was perfect with this saying from CDD Baked with Love! The girl is cut out about 4 inches tall. I added a few fun sequins, a touch of Candy Cane Trendy Twine and some green ribbon. On the eyes, I used a white Signo pen and the on the hat, I used a fine tip pen to add some dots and dashes. There are also white stickles on the spoon, tiny berries and cheeks. So hop, hop, hop on over to Mayra! She is a cutie. My daughter would like her since she likes to bake. Love your card. Awesome. Thank you for sharing. Hope you have a great crafty weekend. This is just super cute and it's perfect with that sentiment. such a cute card. Love it. That holly on her apron is so tiny!! What a lovely card. Your card is so adorable! I love it!! Super cute lil kitchen helper!! awe, super cute! Great details, love this sentiment! Helen this turned out BEAUTIFUL! 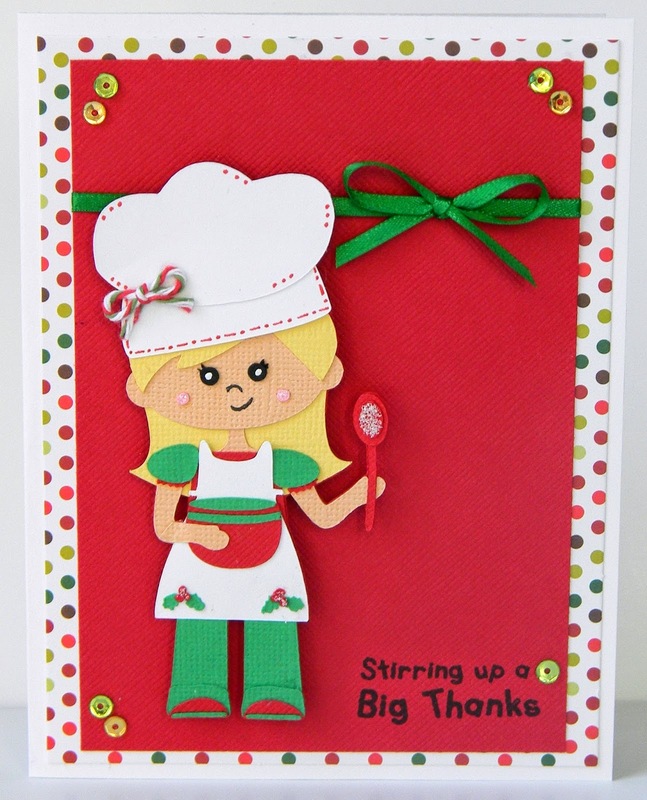 Super cute card Love that little baker!! You did a super job...your little chef is perfect! You display the baking stamp set well. Thank you for sharing you fabulous talent. What a precious card!! Thank you for sharing! Such an adorable card, thank you for sharing it. Love the card and the sentiment. I love how you did the faux stitching. Beautiful work. Your card is so perfect with this set! Love it! Adorable baking girl.It looks like me today when I make my biscuit. Beautiful card. Adorable card!! She is too cute! 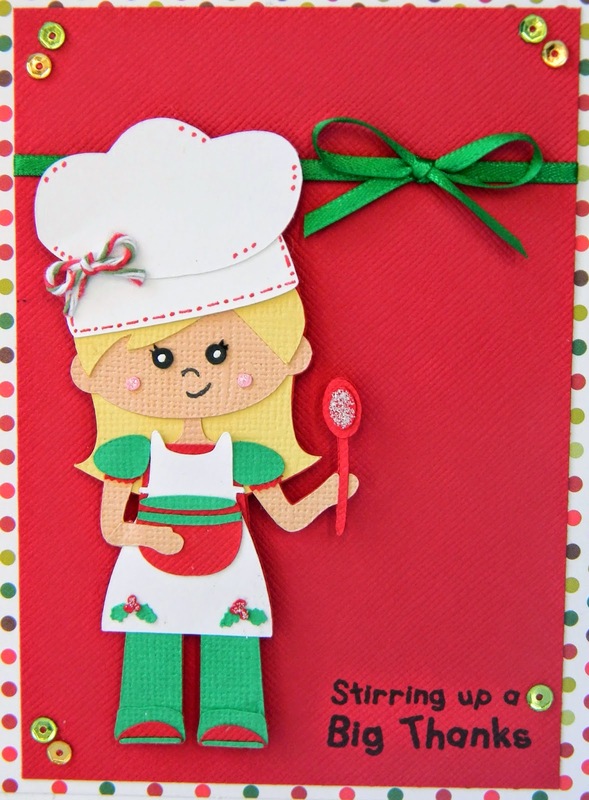 you are stirring up a cute card! your girl is adorable. card is lovely. I love your adorable thank you card! 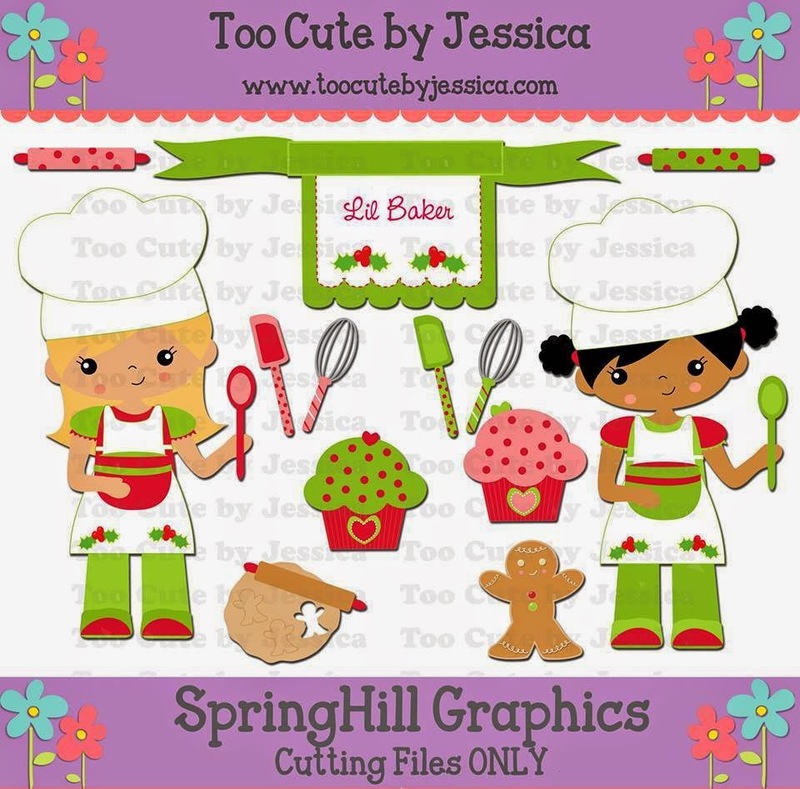 Adorable card, the little baker girl is the cutest! Love the fun touch of sequins and the tiny twine bow! Cute card and great sentiment. Too cute! What a darling baker! Isn't that little blondie too cute! LOL! Hope you had a great Thanksgiving this week! This is great! I think my fav part is the stickles on the spoon - love it! You made such a cute little girl. Oh your card is just darling!! Darling card, awesome sentiment with it. This is sooo cute !!!!! Trendy Twine Post Day--Happy Fall Y'All!